You know when you go to a fancy restaurant and you tell yourself that you are going to choose a nice, healthy salad for your main course… but as soon as you see the menu you have an epiphany, that actually your whole life up to this point has been meticulously planned by some Higher Power to lead straight to a delicious wood-fired pizza with a large side of chips? Yeah, well that kind of ‘change of plan’ is exactly what just happened to me. When I’m doing my triathlon training, I am always conscious of my ultimate goal to compete in a ‘proper’ triathlon some day. As previously stated, the triathlon in February is so short that none of the swimming woes or running pain I have experienced thus far would really prevent me from forcing myself across the finish line eventually; so the only reason I care about getting better is because I have my heart set on being good enough to try the real thing some day. I try to remind myself that the baby triathlon is not a big deal. But I know that if it goes well, there is something way more exciting on the horizon and that’s hard to ignore. There is a very blurry line between committing to the Bribie Triathlon enough to know that I have given it my best shot, and committing so much that I will be in too deep to be able to walk away without guilt and try something else after February if it is not ‘meant to be’. At Bribie, I must give myself the best shot possible, within reason. But what does ‘within reason’ look like? It’s easy for me to answer this in terms of reasonable effort, pain, even reasonable amounts of time. The complications start when I think about Things That Cost Money. Because like most people who aren’t millionaires, I hate the idea of spending money on things I might not use. I’ve been buying bits and pieces here or there and trying to get bargains where I can. But I did some research around triathlon bikes and decided straight away that a bike did not fall ‘within reason’ for my initial attempts at this sport. I set up a savings account for a bike to be bought in the future (target $1000 – the minimum payable according to all my research) and in the meantime, Shane’s blue bike would have to do. As I cleaned and loved the blue horse, Shane supervised and gave me tips for avoiding taking chunks out of my shins with the pedals. He told me stories of the mountain biking he had done in his youth, which turned out to be semi-impressive and could come in handy because it seems I have a resident Bike Expert who may be able to help with this part of my training. He clearly enjoyed showing me how to use the gears and telling me about things like ‘bike computers’. Yes, that’s a real thing. He suggested I get some new tyres called ‘slicks’ that would be faster on the roads than the chunky 4-wheel-drive type things the bike already had. He started to dream. Finally, he lamented that by using his bike, he wouldn’t be able to accompany me on a ride. I told him about my plan to pull him along in a trailer behind me, but he seemed unsatisfied. Before I knew it, I had been bundled into the car and we were on our way out to the shops. We were powered only by momentum and had not discussed a plan. I had every intention of sticking with the blue bike for my baby triathlon. The blue bike is the salad, the option I knew would be best for me and healthiest for our joint bank account. I also knew there was a delicious greasy pizza on the menu. Of course I wanted that instead, but it costs a lot more and I felt guilty even thinking about it. Upon entering the store and mentioning the word triathlon, I was poked and measured by a taller, leggy version of Lauren. She was excited we share the same name. I told her I am just a beginner and I wanted to stick to a budget of a thousand dollars. And it was like Macklemore had gone scooter shopping. ‘Have I got the one for you! Follow me’ she said. She talked us through everything like gears, pedals, tyres, brakes. 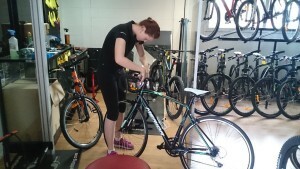 She showed me a beautiful bike in black and mint green that would fit my body perfectly. She made me believe I could get good on this bike. I test drove it for about 3 seconds before I fell in love – head-over-heels, deliriously in love. Pizza is THE BEST. Salad is boring. Shane took over negotiations, sorting me out like a pro with a tyre pump, water bottle cage, computer and all sorts of goodies. He knew all the right questions to ask. Some haggling took place in which everyone became confused as to which Lauren was negotiating with Shane. I was drunk on Shimano gears and chain lube and contrasting bottle cage colours; I lost the plot a little bit. Why were we even negotiating? My ‘Triathlon Bike Savings Account’ had approximately $10.52 in it so far. But apparently, Shane has caught the bug. He bought me the bike, as a gesture of faith in my abilities and a form of non-verbal encouragement I guess. Being a man who is entirely useless with words, he is not cut out to be my cheerleader behind the scenes. That is why we have Matilda in our lives. But I heard the bike talking loud and clear and it said ‘here is the biggest single thing Shane can help you with on your quest. Now you’d better give it your best shot’. The last thing I remember before bundling my new bike into the back of the car and racing home to beat the thunderstorm and have a proper go on it was The Other Lauren looking me in the eye and telling me she doesn’t use bike seat padding. I looked deep into her pupils and she stared coolly back, clearly triple-daring me to be such a wimp as to buy some padded shorts. I smelled victory in the air (possibly just the fumes from Shane’s credit card overheating) and told her that I would try cycling without padding. Because I am a show-off. The total cost of the bike was $1,064.00. I count that as a win. 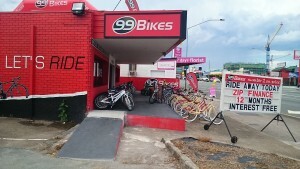 This entry was posted in Show Me Bike, Show Me Shopping and tagged bike, bribie, cycling, Shane, shopping, triathlon. Bookmark the permalink. ← Bring on the Bike! He’ll be pleased about this when he gets home from his bike ride. He is out with Dad and Hannah, training, as those crazy fools (not Dad, he knows his limits) have signed up for a 150 mile one day ride in the Lake District next year! Wise words from Jay! 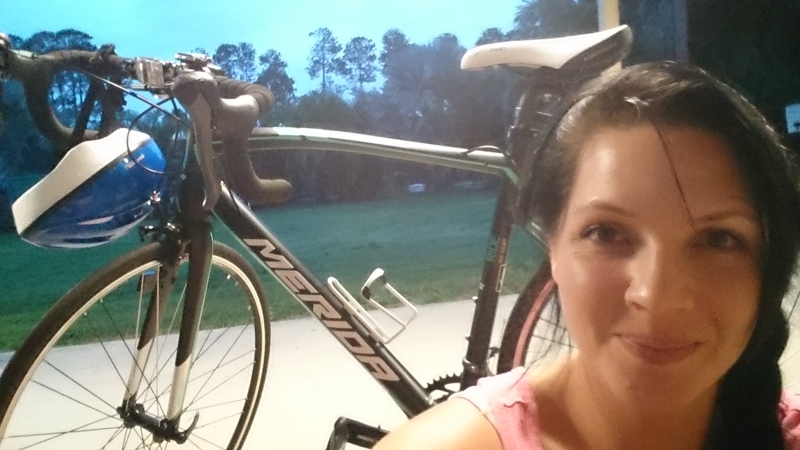 I just hope I do the bike justice; part of me felt safe knowing I could blame the wrong bike for my slow pace. 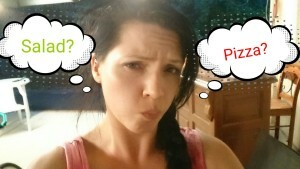 The 150 mile race sounds amazing… I hope Hannah gets some serious padding!! I can’t begin to imagine the pain! Perhaps the lesson is that if there is cake on the menu, you should accept it willingly and openly and worry about the cost later. Who knows if you’ll ever get another chance to have cake (or pizza, or a flashy bike) ever again?! You will need proper padded shorts to cycle any distance , Hannah will tell you that even with hers she still has severe undercarriage problems and is very worried about the 150 miles she has signed up for! #ouchy,ouchy!